Along with the German Meteorological Society for Meteorology, DMG, and the Swiss Society for Meteorology, SGM, the ÖGM has been publishing the scientific journal “Meteorologische Zeitschrift” (MetZet) since 1992, which has been accepted internationally as a recognised journal since its foundation. The first Meteorologische Zeitschrift was published by DMG and ÖGM as early as 1866 and was a globally recognized journal until its war-related termination in 1944. Due to the special political situation in Germany and Austria after the World War II, it was only in 1992 that the MetZet was established again – this time also with the SGM. To motivate young scientists to publish in the MetZet, the ÖGM created the “Max Margules Prize”, named after the world-famous former meteorologist Max Margules, one of the fathers of numerical weather prediction. The prize is awarded every three years to recognise an outstanding paper that has been published in the last three volumes of MetZet. 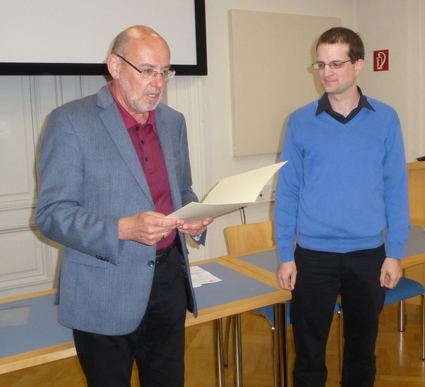 At the Annual General Meeting of the ÖGM on April 4th, 2017, the prize was presented for the first time to Francesco Isotta (MeteoSwiss) for his paper “Evaluation of European Regional Reanalysis and Downscalings for Precipitation in the Alpine Region”, co-authored with others. Another special event was the awarding of the “Golden Hann Medal”, the highest honour of the ÖGM, to Inge Auer, formerly employed by the Austrian National Weather Service ZAMG. 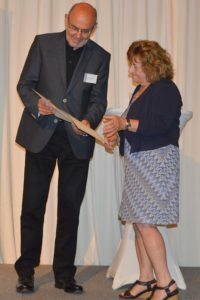 This was awarded as part of the conference “Austrian Climate Day” on May 23rd, 2019 at the University of Vienna (photo below Heide Spitzer, Climate Change Center Austria). The prize, which is named after the most famous Austrian meteorologist Julius Hann, is awarded on occasion to outstanding scientists. Inge Auer received the award in recognition of her extraordinary scientific achievements in the field of climatology. She has made a special contribution to modern, up-to-date processing of long meteorological time series in Austria and in the Alps region. This work – her list of publications includes about 250 papers – is an important basis for further reflection on the problem of climate change. Internationally, she has become known as a leading expert in the homogenization of long data series. She was a member of the WMO Climatology Commission, the European Climate Support Network of EUMETNET and a member of the Programme and Science Committee of the EMS Annual Meeting. ÖGM also organised the 7th Österreichische MeteorologInnentag which took place on 9th and 10th of November 2017 at the University of Graz. The biennial ÖGM Meteorological Day serves to exchange and promote contact between all persons and institutions in Austria interested in atmospheric science and fields of application by supporting networking between these institutions. For young colleagues, the conference is also a platform to present their work. The meeting was attended by around 80 people. 20 lectures were held in 4 sessions and 12 posters were presented in a separate poster session. Poster prizes were awarded by the ÖGM. 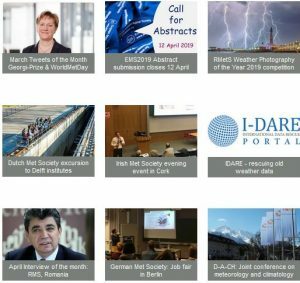 On the ÖGM website, www.meteorologie.at (in German), you can find the link to MeteorologInnentag-website under “Veranstaltungen (Events)” with the complete programme, abstracts and almost all lecture and poster presentations.